This is a great book with an even better story behind it - when the new edition was done by Stanley Paul in 1988, something went awry with the paper specification. To say that the pages were a trifle thin was an understatement and Falkus' reaction was to fly into one of his famous, totally uncontrolled and completely unprintable rages, which ended with him hurling a copy at the wall and the book being reprinted, pronto, with a recall of all the unsold copies. This review is of the Stanley Paul 1988 revised edition - it comes with plate reinforced edges. No, I jest. Now there are books on fishing and there are books on fishing, and this one is something rather special. Hugh might have had a real talent for being objectionable but, despite his uneven temper, he was a very fine writer and there was something in his chemistry which reacted with Fred Buller's tenacious character to produce results which transcended the whole. This book is the best memorial of that partnership that I can think of and if I was allowed to take a second book to my desert island besides the Domesday Book of Mammoth Pike, this would be it. Freshwater Fishing is, in a word, magical. The object of the book, as the authors state in the introduction, was simple: it was to compile a few tested fishing rigs and methods, together with some notes on the fish themselves, which sounds like the recipe for the standard celebrity angler's 'print it, discount it and then remainder it after Christmas' effort, but these were men of an entirely different stamp. Somehow, I think the modest opening paragraph understates the task the authors had in mind, which was to write a book on how to catch everything - and I mean everything, that had fins and swam in freshwater in the British Isles. Do bear in mind that this was back in the days before word processors and digital anything, so the whole job had to be done laboriously by hand, one thing which is generally forgotten about the book being that some of the chapters were originally printed in Creel magazine. Faced with the amount of effort involved, most folk would not have included both species of shad, the houting, or the vendace in the equation and few would have given much thought to the sturgeon, although I can't help noticing a particular lack of tested fishing rigs and methods for the latter. Then there is the cooking, something dear to Hugh's heart. Freshwater Fishing begins with the barbel, for which no less than five recipes are given, including one from Mrs. Beeton and three from Auguste Escoffier. You get the picture. This is not a book, it is a dream. Okay, so sometimes the authors slip off their cloud - there aren't any recipes for the bullhead - but then they make amends by having three for burbot, which is most probably extinct in this country even if it were legal to catch it. 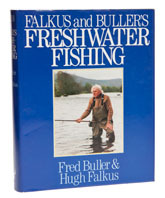 Every time I read this book, my mind's eye pictures Hugh and Fred sat in a tiny study, surrounded by teetering piles of books, debating whether or not to include Reverend Daniel's unlikely claim to have caught dace wieghing upwards of a pound on night lines baited with minnows for eels. God, it must have been tough, particularly when it came to finding out where the whisky had gotten to in the wee small hours. It isn't surprising that Fred remembers it as one of the most enjoyable times in his life. The first two thirds of the book are the best bit, taken up as they are with accounts of each species and how to eat them; the last third is getting a bit dated now, though is filled with otherwise good advice about rods and kit. The illustrations are fabulous, including several of pike stuck inside other pike and a classic shot of Moc Morgan stood knee deep in Lake Bala on a day when the weather was so bad that even the fish were using umbrellas. The 1988 reprint was followed by three more, which were pitched at the discount market and total sales reached 33,000, which is unprecedented for an angling book, as print runs generally only reach about 2% of that, so copies of this wonderful book are remarkably cheap. If you don't own it already, I suggest that you put the deficiency right at once. Theoretically, the most valuable volumes are the few Stanley Paul 1988 reprints that were sold before the Falkus inspired recall, but my choice would either be the first or the '88 Stanley Paul reprint.